I know many of you are saying wait I thought she was trying to get pregnant she shouldn't be drinking. Well, yes I am trying to get pregnant. And although I am trying I know that I am not yet pregnant, took a test and sadly not yet. But that means yay for a drink of wine. I love wine and the shipment of flipflop wine could not have come at a better time. I was sent 3 bottles to sample this time. I received the Cabernet, Pinot Noir, and Chardonnay. Cabernet Sauvignon: Full-bodied, blackberry fruit, dark cherries and la long lingering finish. Pinot Noir: Medium-bodied, bright cherry, sweet spice and a supple, velvety finish. Chardonnay: Medium-bodied, pineapple, soft vanilla and a long lingering finish. Knowing that I am not yet pregnant I excitedly opened up the first of three wines that were sent to me to sample. I immediately wanted to try the Cabernet Sauvignon. I am a red wine drinker most of the time. I don't completely rule out whites, but if given the choice of red or white I would go for the red and Cabernet being my favorite type of red. John and I enjoyed a glass of Cabernet with dinner that night. The wine is dry and tastes great. I loved it and I really think John did. Well, I know he did because he drank it all. I went to get more and it was gone. A couple of days later we decided to try another bottle so I opened the Pinot Noir. I haven't had much experience with Pinot Noir. I think it was really good. It was not quite as dry as the Cabernet. It was very good and I got to have a second glass from this bottle. John also enjoyed this wine and helped to finish off the bottle. And the last bottle we tried was the Chardonnay. The Chardonnay was also really good. It is light and just a little sweet. John is not much of a white wine drinker so he didn't try this wine, but I enjoyed it. Some of the things I love about flipflop wines are the price and the taste. Each of these bottles only cost $7. That is an amazing price for good wine. I also like that on each bottle it has a little chart that indicates if the wine is dry, sweet or in between. In addition each bottle tells you what it tastes like and what is is best paired with. And with the items it is best paired with the foods are typical foods anyone would eat, like pizza, Cesar salad, mac & cheese, and chocolate chip cookies. This is helpful for those that don't know what foods pair with each wine. I love wine, but I am never sure what goes with what when it comes to pairing. And of course I love companies that give back. 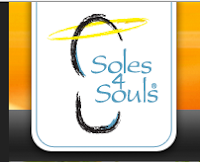 Flipflop wines gives back through their partnership with Soles4Soles. The mission for Soles4Soles is to get shoes to those that don't have them. There are many children around the world that don't even have shoes to wear. There are more than 300 million children that don't have shoes. Shoes help to prevent many diseases. For every bottle of Flipflop wines purchased another pair of shoes are distributed to a child in need. Flipflop wines are available online and in stores. Next time your shopping for wine for yourself or a gift look for flipflop wine. This wine is sure to be a hit with you and your guests. Follow flipflop wines on facebook and twitter.